Nikon has unveiled the world's first waterproof compact system camera. According to Nikon, the AW1 is submersible down to 15 meters; that is with one of its two available waterproof lenses. The first is a 11–27.5mm (30–75mm equivalent) f/3.5–5.6, which comes with the camera. A 10mm (27mm equivalent) f/2.8 lens is also available. As part of Nikon's compact system range, it is also compatible with other lenses. However, only the two waterproof lenses can be used to take pictures underwater. The camera is also dust, shock and freeze proof according to Nikon. 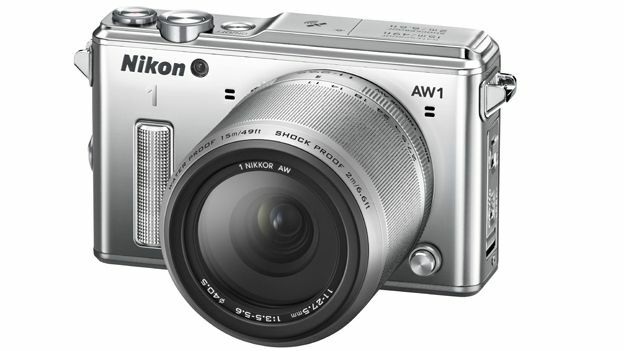 Specs wise, the AW1 is similar to the Nikon 1 J3. It has a 14.2 megapixel 1-inch CMOS sensor and the Expeed 3A processing engine. It also comes with all the features you'd expect from a Nikon 1 camera. 1080p movie capture, 15fps burst shooting, slow view, smart photo selector, motion snapshot and the Nikon 1's hybrid autofocus system are all featured. However, despite essentially being a waterproof J3, it does not retain its slim dimensions. Perhaps unsurprisingly, the waterproofing adds some extra bulk – not much, but it is noticeable. It is unknown if Nikon is planning to release further waterproof lenses. The Nikon 1 AW1 will be available from October 1st with an RRP of £750 for the lens kit model. The 10mm waterproof lens is sold separately and will cost £300.